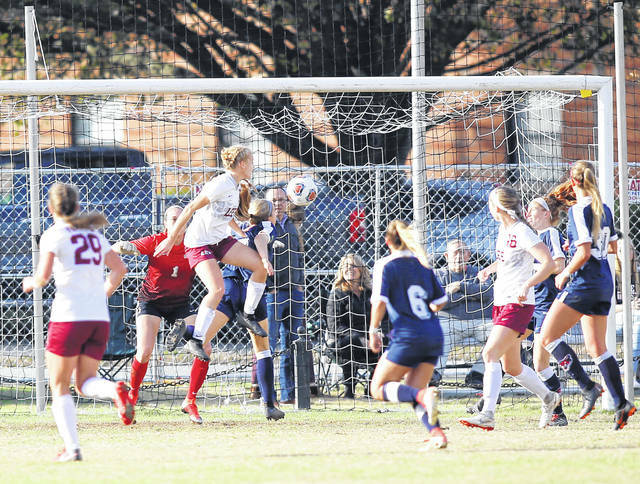 Photo courtesy Lee University Lee University’s Lauren Weimer, a Tippecanoe High School graduate, heads in the game-winning goal against Columbus State on Nov. 18 to send the Flames women’s soccer team to its first-ever NCAA Division II Final Four appearance. 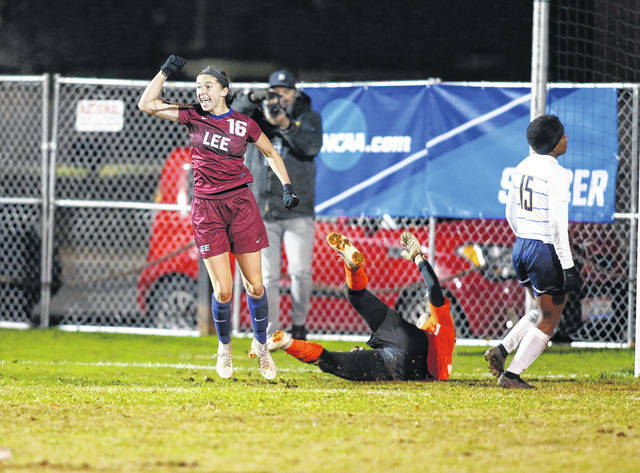 Photo courtesy Lee University Lee University senior Lauren Peters, a Troy Christian High School graduate, celebrates her game-winning goal against Mississipi College in the NCAA Division II South Region championship game on Nov. 16. 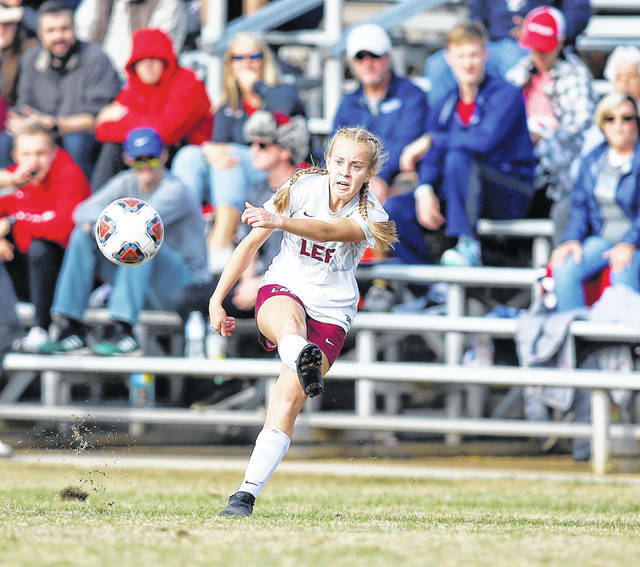 Photo courtesy Lee University Lee University’s Lauren Weimer plays the ball forward during a game this season. Weimer is a Tippecanoe graduate. 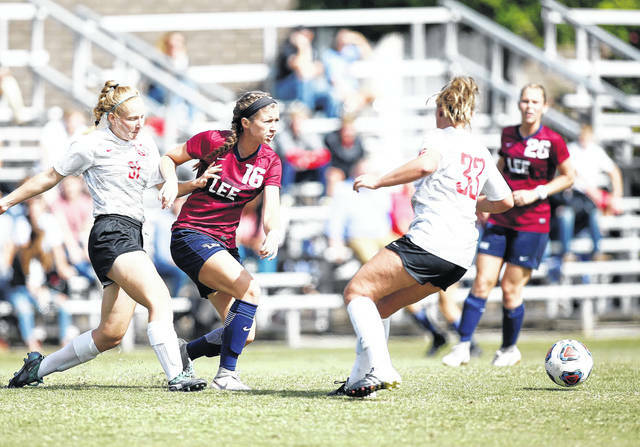 Photo courtesy Lee University Lee University’s Lauren Peters (16) plays the ball through a pair of defenders. Peters is a Troy Christian graduate. PITTSBURGH — For two Miami County graduates from different high schools to end up on the same college team is already special enough. But for them both to score game-winning goals in consecutive games, both monumental victories in their program’s history? That’s exactly what Lauren Peters and Lauren Weimer did for the Lee University women’s soccer team as it competes in the NCAA Division II Championship tournament, with Peters scoring the game-winner in overtime in the Flames’ 2-1 victory over Mississipi College in the South Region championship match and Weimer heading in the only score in a 1-0 victory over Columbus State in the Elite Eight, propelling Lee to its first-ever Final Four appearance. Peters, now a senior forward at Lee, is a 2015 Troy Christian High School graduate, while Weimer is a 2018 Tippecanoe High School graduate and now a freshman defender for the Flames. Lee, a No. 4 seed in the South Region, began the tournament with a 2-1 victory over No. 5 Rollins, then it knocked off the region’s top seed and the No. 2 team in the country, West Florida, 1-0 in the regional semifinal — both wins coming in overtime — which set up a regional final matchup against third-seeded Mississippi College for the South title. The Flames fell behind 1-0, but Mia Hollingsworth tied the score at the 73:01 mark on an assist from Peters to send the game to overtime. And in the 108th minute, Peters drove home a rebound off a shot by Hollingsworth to seal a 2-1 victory and send Lee to its first-ever Elite Eight appearance. “It was a crazy game,” Peters said. “We had a lot of momentum going forward from the second half into overtime. We had a couple of really good opportunities. In high school, Peters’ Eagles reached the Ohio Division III district final all four years, including a regional final berth in 2012 — with Peters, the three-time Metro Buckeye Conference Player of the Year, typically leading the way. In the end, all of the goals she’d scored in her career were building towards that one. The regional final performance gave Peters six goals and two assists on the season, with a career total of 21 goals and four assists. Two of Peters’ goals this season have been game-winners, giving her six of those in her collegiate career. And in the Elite Eight, the Flames were matched up against Southeast Region champion and the No. 3 team in the country, Columbus State. This time, the Flames would not need overtime to advance as Weimer headed in a cross by Anna Lanter at the 62:10 mark to put Lee up 1-0, and junior keeper Taylor Green made that goal stand up by making six saves to post a shutout. Weimer, a two-time first team All-Greater Western Ohio Conference American League and one-time first team Central Buckeye Conference Kenton Trail Division honoree in high school, now has three goals in her freshman season — all three of them game-winners. “It was really exciting to see her be able to fulfill that and bring our team even further than we’ve been before,” Peters said. The Flames (17-6-1) will now get the chance to finish its tour of D-II’s top three teams, facing unbeaten Grand Valley State (24-0-1), the No. 1 team in the country, in the Final Four at 8 p.m. Thursday in Pittsburgh. The Lakers hammered defending D-II national champion Central Missouri 6-1 in the tournament’s quarterfinal round. “We had a rough start at the beginning of the season, and we’ve been able to peak at the right time. It’s just a really amazing thing to be a part of,” Peters said. https://www.tdn-net.com/wp-content/uploads/sites/21/2018/11/web1_111818_-Lee_Weimer_header.jpgPhoto courtesy Lee University Lee University’s Lauren Weimer, a Tippecanoe High School graduate, heads in the game-winning goal against Columbus State on Nov. 18 to send the Flames women’s soccer team to its first-ever NCAA Division II Final Four appearance. https://www.tdn-net.com/wp-content/uploads/sites/21/2018/11/web1_111618_Lee_Peters_celebrate.jpgPhoto courtesy Lee University Lee University senior Lauren Peters, a Troy Christian High School graduate, celebrates her game-winning goal against Mississipi College in the NCAA Division II South Region championship game on Nov. 16.
https://www.tdn-net.com/wp-content/uploads/sites/21/2018/11/web1_111818_Lee_Weimer.jpgPhoto courtesy Lee University Lee University’s Lauren Weimer plays the ball forward during a game this season. Weimer is a Tippecanoe graduate. https://www.tdn-net.com/wp-content/uploads/sites/21/2018/11/web1_Lee_Peters.jpgPhoto courtesy Lee University Lee University’s Lauren Peters (16) plays the ball through a pair of defenders. Peters is a Troy Christian graduate.